Counterparty is a platform that extends Bitcoin in many ways including allowing users to create their own digital tokens and these can be exchanged peer-to-peer on a DEX. The platform launched in January 2014. The platform uses XCP as its native token, which is not mineable and was not sold in an ICO like many other tokens. The token came into existence by “Proof-of-Burn” method where a given number of Bitcoins were sent to an unspendable address, and in exchange, an equivalent number of XCP (2.65 million) were generated on the Bitcoin blockchain. Details on where the are available: about 2,130 BTC were sent to the address 1CounterpartyXXXXXXXXXXXXXXXUWLpVr. The method of coin generation is used to avoid pre-mining or ICOs and gives a a fair and equal opportunity to everyone. The XCP are used to run smart contracts. XCP was one of the top ten cryptocurrencies by market cap then, reaching as high as high of US$25 million on November 12, 2014. This put it in the fifth position after Bitcoin, Ripple, Litecoin, and BitShares. The performance hasn’t been the best following the launch of more competing tokens such as Ethereum and the fact that it was a purely donation-based group. For now, much of its further development depend on Bitcoin protocol improvements. For instance, the platform’s implementation of SegWit functionality was rather efficient. Linkage to Bitcoin development also explains why a number of challenges affect the Counterparty, an example being high network fees in the recent past. Counterparty is built on the Bitcoin blockchain and lets users create and exchange custom tokens just like Waves and Ethereum but has the advantage that it uses the already popular Bitcoin blockchain. The DEX allows users to trade crypto assets on a peer-to-peer method even for crypto tokens created on the platform. Apart from DEX, it also has other features such as asset creation as mentioned. You can create custom named assets for a small anti-spam fee or free for numerical assets. Counterparty wallets are another feature of the platform and they work on web, browser and mobile devices. To trade, you simply create and place a buy order on the DEX, and it is matched for settlement. You can cancel it at any time. 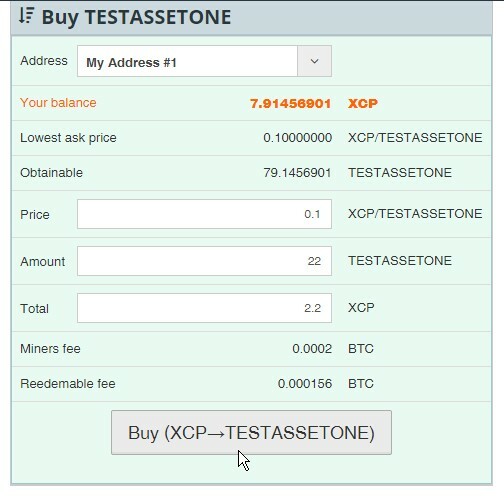 To buy an XCP-denominated asset, the full guide is here: you first create a wallet and ensure to write the pass phrase. You can test through the testnet first, where you load and send fake or test assets before using real assets. You can acquire the wallet through the private modes (Chrome, CTRL+SHIFT+N, in Firefox, CTRL+SHIFT+P) which will disable the extensions or addons. To buy, navigate to Exchange > Markets and check among the Top Pairs for your choice. Navigate to More > Top Assets in order to see recent price trends. Otherwise, if the name you are searching for is not in the Top Pairs, move to the right and under Select Another Pair, type asset token name. You can access the buy and sell orders by clicking on the TESTASSETONE. Click on he order if you are happy with the price and the wallet will populate the Buy Order form. It is not possible to cancel the matched orders, so ensure the price is acceptable. It helps avoid you paying 0.001 for an asset that normally costs 0.0001, for instance. You can modify the price and amount of the Buy Form, for instance if the Total is a large number. Press the Buy button once you are through. Selling uses the same process but in this case, you are creating a sell order. Counterparty uses Bitcoin-aware smart contracts but these are also able to interact with Counterparty tokens. The platform is also developing Lightning Network support for Bitcoin to allow rapid exchange of assets on the network. This will also allow exchange of off-chain exchange of Counterparty tokens. The development could see adoption by a large number of users as more adopt the Lightning Network. The DEX allows those using other services on Counterparty to save on cost as well as to avoid using third parties. You will also be able to get some Counterparty-listed assets on other exchanges including Poloniex and MasterXchange. For those wishing to pay distributions to asset holders, you can use Counterparty’s distribution function to pay out dividends in BTC, for instance. You can do this on the basis of the amount of digital stock each person owns. This is done by using voting contracts on Counterparty and issue a voting token. You then instruct the voters to send their tokens to specified contract addresses based on if they like to vote yes or no. The winning contract receives most voting tokens. Like said, Counterparty also allows you to create custom tokens. You do this by accessing the button to create the assets, which is inside the native Counterparty wallet. You then get to specify the divisibility of the token and name of the token. After creation, the system will broadcast the token.